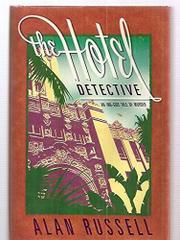  Left in charge of La Jolla's venerable California Hotel by the weekend absence of his charmless boss--who's fired the chief of hotel security on his way out the door--assistant general manager Am Caulfield juggles an improbable bunch of ninnies and knaves. Conventioning contractor Tim Kelly has capped his evening on the town by jumping from his seventh-floor window (but did he jump?). Overendowed Las Vegas entertainer Kris Carr reports the theft of four gargantuan brassieres. Executive chef Marcel Charvet, who's finally found out what the staff mean when they say he's been serving road kill, vindictively prepares the real thing, opossum Meurtre de la Route, for an eminent food critic. And in addition to the everyday crises posed by the Whining Weintraubs and Mr. Harmon, the compulsive adulterator of liquor in the guest-room honor bars, estranged husband Carlton Smoltz has killed his wife and her lawyer-lover in 605 and then gone underground as one of 175 eponymous participants in the Bob Johnson Society--all of which makes more trouble for the actors trying to entertain the remaining Bob Johnsons by staging a Murder Mayhem Weekend. This waggish take on Grand Hotel reveals a new side--corny, but winsome--of the usually downbeat Russell (The Forest Prime Evil, 1992). Am seems poised for a series, though you've got to wonder what else could go wrong at the California.